If someone phones your office number when you’re not available to answer, the caller can leave a voice message for you. UCT’s voicemail system stores the message and you can access it at your convenience later on. The system is secure and no-one apart from you can access the messages – unless you share your voicemail PIN number with others (which is not recommended). Set up your new PIN. Be sure to choose a unique and complex number (no consecutive numbers). For example, “123456” will not be allowed. After setting your PIN, you may see a warning about your phone extension not being configured. This message relates to online conferences – not your PIN or voicemail – so you can ignore it. Sign Out of the interface. From your office phone, dial 8999. After the greeting, enter your PIN followed by the hash key (#) when prompted. Upon login, you’ll be asked to enter a new 6-digit PIN. Follow the voice instructions to change the PIN. Once you have successfully changed your PIN, you will be taken to the main menu. How do you know that you've missed a call or that you have voicemail? 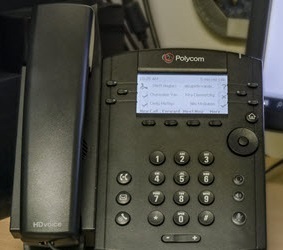 On your IP phone’s display, a text message will indicated missed call(s). Press to see Missed Calls. Scroll and select a missed call. Press to select. Scroll down to see time of call. Press Dial to call the number. If the caller left a message, a red light will flash at the top of your phone. In Outlook, you will also receive an email notification of the missed call and voicemail. Once you read this message, the voicemail will be marked as ‘read’. In your email Inbox, open the message notifying you of the voicemail and play the voicemail directly from the message. Alternatively, dial 8999 on your IP phone then enter your PIN to access your voice messages. Dial 8999 from any UCT phone. The greeting is directed at the current phone owner. Press * to change to your personal voicemail. Enter your UCT extension (e.g. 1234). After the greeting, enter your full 10-digit UCT phone number (e.g. 021 650 1234). Enter your PIN and continue to use voicemail as you would normally do. Dial 021 650 8999 from any phone. Log on to the Outlook web app using your UCT credentials. In the top-right corner of your screen, click Settings > Options. From the Options list on the left-hand side of your screen, click General then click the relevant setting under Voicemail. Log off the Outlook web app. From the Options list on the left-hand side of your screen, click General > Voicemail > Reset pin. Click Reset my voicemail PIN. You will receive an email in your mailbox with your new PIN. Use this PIN to access your mailbox.